Professional Association Diving Instructors Key Largo. Today was all about PADI training. We use the abbreviation PADI daily and wanted to write a blog today explaining what that stands for. PADI stands for Professional Association of Diving Instructors and Sail Fish Scuba is a PADI 5 star diving center in Key Largo, Florida Keys. 5 star means that we only focus on training PADI courses. We at Sail Fish Scuba take that very seriously and pride ourselves with our attention to training details. PADI Instructor Michael taught open water referral dive #4 and advanced open water naturalist training dives this morning on the boat. Also this morning MSDT PADI Instructor Thomas taught classroom scuba tune up with our newest student and they completed a fun pool tune up of skills. The afternoon was a fun mix of instruction on dive boat Deeper. Instructor Michael completed PADI advanced open water deep and wreck training while at the Benwood Wall and Wreck. 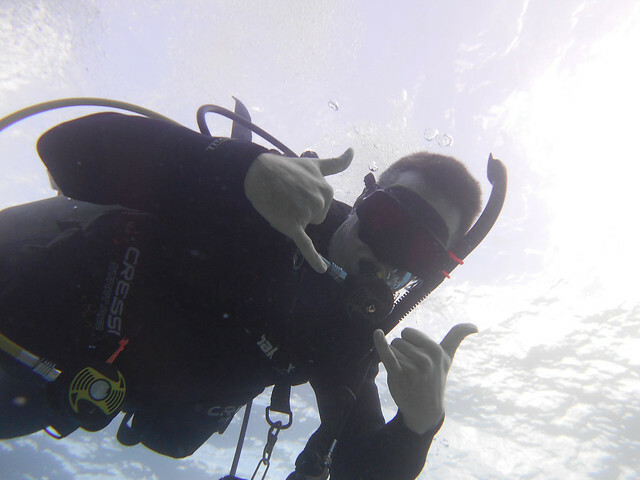 MSDT Instructor Thomas guided his group of tuned up certified dives at Benwood shipwreck and French Reef. Lots of fun photos were taken by our crew. This morning at Key Largo Shallow Reef Sites PADI Instructor Michael trained one student on open water referral dive #4 and made him our newest Open Water Certified Diver! Immediately following the completion of that certification our student and his girlfriend started their PADI Advanced Open Water Certifications with Inst. Michael. They started AOW with Underwater Naturalist specialty. We give thanks to the dive shop inside the Key Largo Bay Beach Marriott, Pirate Cove Watersports for the seats on their morning boat. Scuba Tune Up Training at Sail Fish Scuba Dive Shop was completed this morning with MSDT PADI Instructor Thomas. Our newest Scuba Tune Up student diver had earned his NAUI certification back in 1973 and had not gotten to do much diving since then. The training back then was so intense and extensive that all his scuba memory came right back to him quickly. This afternoon at The Benwood Wall and Shipwreck Instructor Michael taught PADI AOW Deep with 2 students. They then had fun exploring the Benwood shipwreck for the balance of the dive. The certified diver group had tons of wreck diving fun diving around this 1942 natural navigation shipwreck with Instructor Thomas. The second site at French Reef Mike’s group of PADI students just enjoyed a fun dive to complete their long day of training. They had fun posing for the camera and Instructor Mike took great photos. Instructor Thomas showed his group of 3 certified divers such an amazing time exploring all the nooks and crannies of this wonderful Florida Keys living coral reef. Flat like a lake this morning and 2.0 chop in afternoon. Referral OW #4 dive and fun dive for AOW student. Completed PADI AOW Naturalist training skills. Wall exploration to depth and checking out an old shipwreck. Exploring the lovely reef filled with fish and tons of corals. BOAT Instruction : OWSI Instructor Michael teaching PADI OW#4 & AOW Naturalist this morning on the reef. Class/Pool Instruction: Instructor Thomas training at Jacobs Aquatic Center pool with Scuba Tune Up students this morning.